I have never before experienced such consistent quality in any brand of shoe before. To have a brand where two different style shoes and a sandal all fit perfectly and are a dream to walk in was beyond belief. Comfort is number one for me, then due to having chemical sensitivities, natural materials without the toxic off-gassing (new shoe smell), common of most shoes is greatly important. While fashion is the least important to me, it's always nice to look good too, something I've always had to sacrifice with other shoes until now! When I first saw the prices, I thought, I'll never spend that on shoes. I was wrong. Naot have proven to me that you get what you pay for. Like linen sheets, they only get more comfortable with wear. And I actually forget all about my feet when I'm wearing them, that is, until someone asks me where did I get the beautiful shoes; Something that has never happened before wearing Naots. I sometimes would have to take a second pair of shoes with me just so that I could give my feet a break from one pain only to switch to another. No more. To go barefoot in sandals for hours without even thinking about foot pain is amazing! Padded heel cup for stability & comfort. Sorry for the wind in the camera, but that's Newfoundland weather for ya! I wanted to try these shoes as the brand ranks in the top 10 comfort shoe brands in the world, and also because Naot manufactures their shoes in a manner that is as environmentally friendly as possible. They use vegetable dyed leathers, water based glues and renewable cork in their shoe construction. 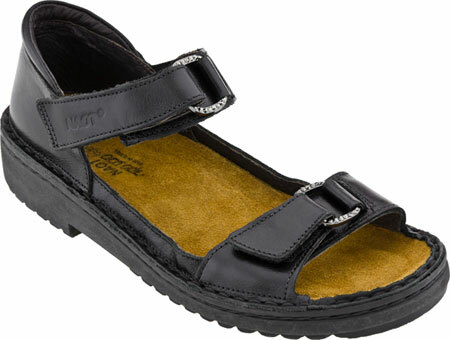 Just like their shoes, these sandals fit amazingly well, conform to your feet, and if you have sensitive or painful feet as I do, these are extremely comfortable to wear. I love the cute design and the soft suede foot bed as well as easy to adjust straps. These shoes are true to size. Once again, a women's 38 fit perfectly. There are no irritation or rub points. The adjustable design make for a comfortable secure fit. I used them for both short and long walks on pavement, gravel, grass.